This is probably useless, wishful thinking given the technical constraints that we have, but why not, since everyone here likes to spend their one and only life moving fictional stick men around a world that does not exist outside their hard drives anyway. 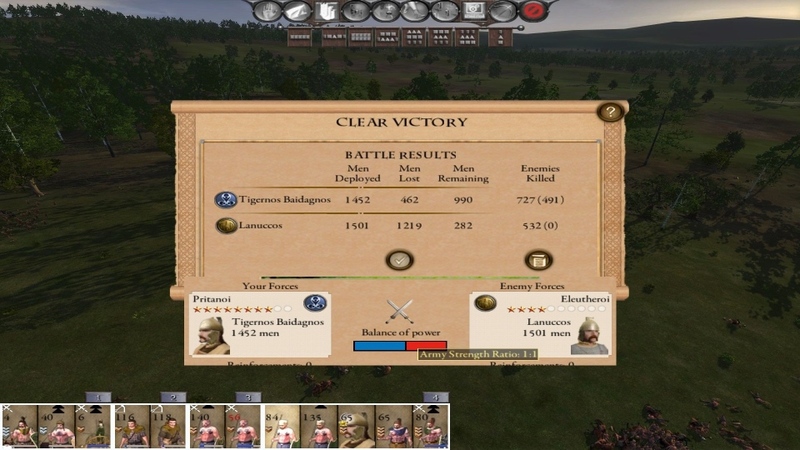 Many times when I train fresh, inexperienced triarii or other "hardened veteran" units to join their more experienced junior troops, I think how cool it would be if the game actually graduated units in seniority instead of sticking a chevron and a stat bonus to them. Do you ever think about that and, if you do, do you have some kind of role-playing explanation to that? Such as individual troops get relieved in the background and get to return home to rest and then join a more advanced unit being mustered as "fresh" in your city? Would you like to play EB2 in which, say, the surviving half of a principes unit would be upgraded into triarii? Can you imagine negative or ahistorical consequences to that sort of game mechanic? I imagine that any city would have to have a certain fixed number of experienced units available from the start, but sooner or later you would have to produce your own by sending junior units out. I actually find re-training units to be an exploit and I now don't ever re-train them. I just recruit new units and merge them - as proposed in my Home rules for playing a game without exploiting the M2TW engine deficiencies. This makes the +experience bonuses of the buildings much more important. This is because if you do re-train, you never recruit new units beyond a few first ones and the +1 or +2 bonuses becomes irrelevant. If you don't, they're essential for the melee units to jump to the first silver chevron to get the second bonus (the missile units and cavalry can actually get to the gold ones). Get silver chevroned infantry without autoresolve and retraining. I dare ya, I double dare ya! When I do get infantry to silver, I usually put them in reserve. They earned it. Last edited by Rad; February 05, 2019 at 03:00 PM. Do you ever think about that and, if you do, do you have some kind of role-playing explanation to that? The closest thing that M2TW has that is capable of graduating units in "seniority" would be the legion names system that remains from the older RTW BI. Here are my Ambraktoi and Agrokunes just before silver. They started with 0, there're 3 units of each at the beginning, then merged due to the losses. For the missiles and cavalry, it's possible to get to gold with a single unit - the Seguorina was such and actually got golden chevron in this battle but towards the end lost a few guys from its ranks, apparently those best ones, and went down to three silver (it's actually a marvel that the game counts kills for each individual soldier). Thanks for the feedback, guys. I am familiar with JoC's never retrain policy and I actually intend to try that in my next playthrough. I do wonder how the AI manages to get many chevrons on their units, however, but that ought to be okay; the AI is at a disadvantage in so many things anyway so that should nicely even things out. Rad's idea of putting units into reserve is interesting. I tend to leave inexperienced units into garrisons as they cost as much as the experienced ones but offer slightly less on the battlefield. Maybe I should break out of that habit for role-playing purposes. Naming units has been on my wishlist from day one, so I am definitely going to look more closely into the solution that Lusitanio brought up; thanks for doing so! Nevertheless, I might have been ambiguous in what I meant, but I was playing around with the idea that we could have the unit types themselves change for an individual existing unit. Let us say we are playing the Romans. We recruit a fresh unit of leves. When they see enough of battle, the unit itself becomes hastatii. When the hastatii unit fights and survives, it becomes principes. Further on, it transforms into triarii. I would like to see that kind of mechanism in a game, but I guess that is not feasible in Total War games. The historical descriptions refer to experience, albeit to wealth and social standing as well. But the way I have understood the historical circumstances, no young buck starts out as a triarius. Last edited by Septentrionalis; February 05, 2019 at 03:55 PM. Naming units has been on my wishlist from day one, so I am definitely going to look more closely into the solution that Lusitanio brought up; thanks for doing so! This is beside the point that I was making in the opening post, but I will comment on it here nonetheless. The rule number 13 is right on the money in the way it is formulated in the headline; a group of 10(0) surviving soldiers will not be able to whip up a unit of 160(0) with equal experience. However, accepting new men into a unit will not cause a dilution of experience directly proportional to the number of fresh recruits. Both approaches of retraining anything and retraining nothing fail in one of the two extremes. Military units, unless suffering from bad leadership, produce an esprit de corps and benefit from shared experience. Individual fresh soldiers brought into a well-functioning veteran unit will constantly learn from the experienced soldiers around them and will eventually feel more secure facing battle with them. As far as game mechanics go, I would probably give experienced units a substantial morale bonus and only a modest efficiency bonus, if they are equal to wholly fresh units in terms of equipment and tactics. For the missiles and cavalry, it's possible to get to gold with a single unit - the Seguorina was such and actually got golden chevron in this battle but towards the end lost a few guys from its ranks, apparently those best ones, and went down to three silver (it's actually a marvel that the game counts kills for each individual soldier). Yeah, I have plenty of gold chevroned cavalry - chasing routed enemies helps out a lot.